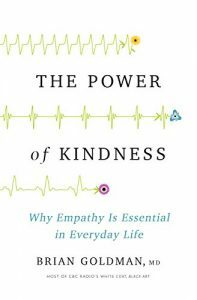 Dr. Brian Goldman of entered The Exam Room recently to discuss his new book, The Power of Kindness, Why Empathy is Essential in Everyday Life. Dr. Goldman is an ER physician and medical journalist. He’s the host of Canada’s CBC Radio One White Coat, Black Art. As he describes, he has made a successful career pulling back the curtain on the world of medicine by getting front line doctors and nurses to speak candidly about their work. And he clearly did that with me. Check out the episode which was a lot of fun to record. The narrative stream. The Power of Kindness reads like a story. It is the story of the author’s journey of self-discovery that takes him through multiple countries and even into a functional MRI scanner to better understand empathy. The author. As a mid-career physician I found Goldman relatable. As an individual with deep clinical experience Goldman confronts even his own potential shortcomings and vulnerabilities to help the reader understand empathy and kindness. I find myself going through a similar sequence of self-exploration at this point in my career. The evidence. This book serves as solid primer of some of the most interesting evidence surrounding what we know and don’t know about empathy. He shattered my previous assumptions about the empathic response as hardwired versus learned. When woven into his journey, The Power of Kindness makes for an informative, entertaining read. The subject. As medicine evolves as a sequence of beaurocratic processes, The Power of Kindness couldn’t come at a better time. I would add that this belongs in the curriculum of every medical school and residency program. Grab a copy and check out the latest episode of The Exam Room.